Bio: How likely is it that two pastels artists, of the same name, both signature status PSA, live on Long Island? Jane McGraw-Teubner is on the Board of Directors of the Catherine Lorillard Wolfe Art Club, NYC and a Resident Artist in the Salmagundi Art Club. She is a founding member of the Long Island Plein Air Painters’ Society. Jane studied with Jeff Webb, Frank Federico, Albert Handel, Larry Blovits, Richard McKinley and at the Art Students League with Richard Pionk and local pastel artists at the Art League of Long Island. 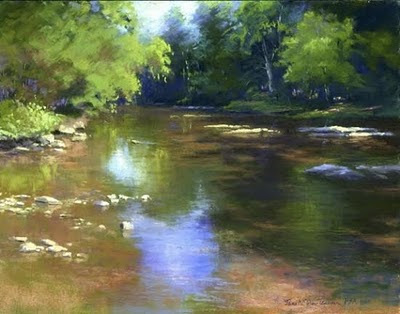 In September, 2009, she won her third award at the Pastel Society of America’s Annual National Show and received the status of Master Pastelist. Navigation: Main menu remains available at side. This is another site that uses the FineArtStudioOnline template. There is no personal information, other than a photograph, in About the artist. Her biographical information is on the home page. The Blog link remains to be activated. However, Jane has a legacy website, so presumably this one is currently being developed. Image View: Each gallery page contains thumbnails with data on size and medium displayed. Thumbnails enlarge in slideshow. Reflections is 550x430, 176 KB. Tatiana - I whole-heartedly agree. This is a very fine painting. Now and again I come upon an exceptional piece that I would like to see "in the flesh" - this one I lust after!